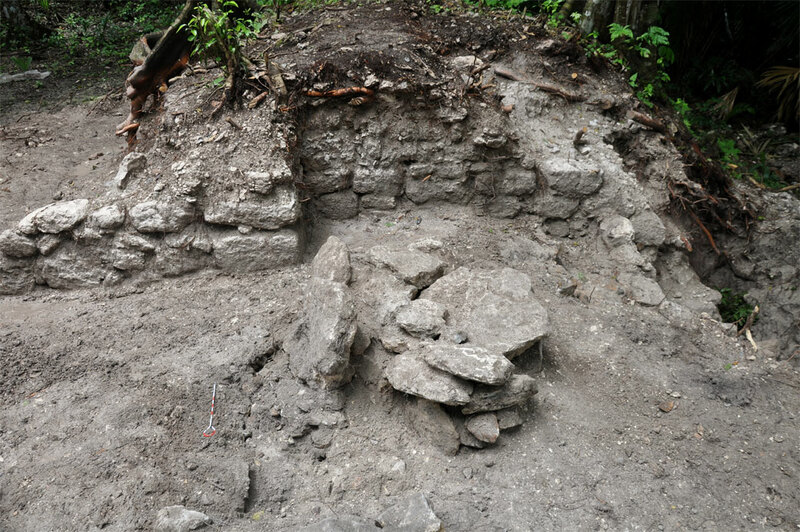 Excavation of elite residences at Nojol Nah by archaeologists from the Maya Research Program in Belize, has yielded a large, well preserved skeletal sample – a minimum of 63 individuals found over a five year period including 25 in the 2012 season at El Palacio, a large elite double courtyard complex within the site and dating to the Late Terminal Classic (AD800 -900). Documentation of 12 building/rubble mounds. Initial investigations at the largest structure (4D2), which is located within Courtyard A. Completion of excavation at building (4C12) in Courtyard B.
Excavation of a termination deposit identified in Courtyard B. 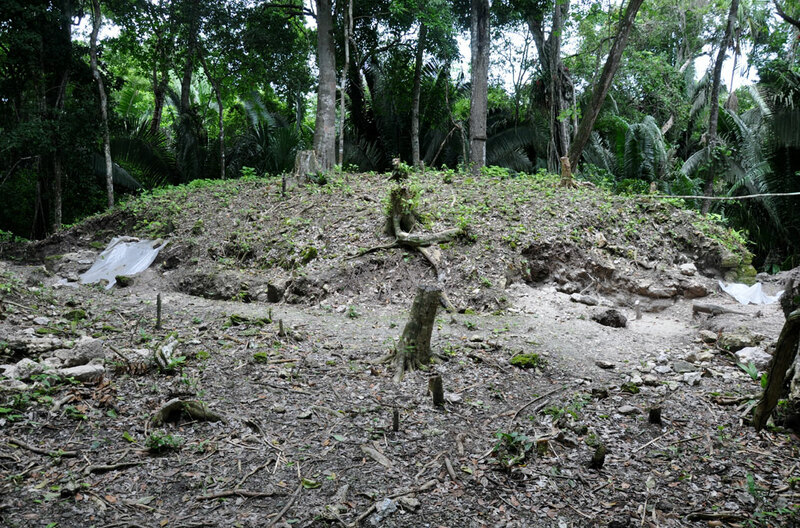 The largest structure at El Palacio, (4D2), is a complicated building and although archaeologically, some progress has been made, it is in a poor state of preservation due to its steep gradient and abundant tree root intrusions. The houses at Nojol Nah are constructed of large, rectangular limestone slabs and are artificially raised by adding jagged chert cobbles. Preliminary work at 4D2 shows that much of the building has been eroded as removal of the upper humic layer revealed chert cobbles which should have been found beneath the floor – meaning the floors are no longer intact. However, there are limestone walls present that have been buried in the chert cobbles, indicating that the building was added on to at some point in the past. 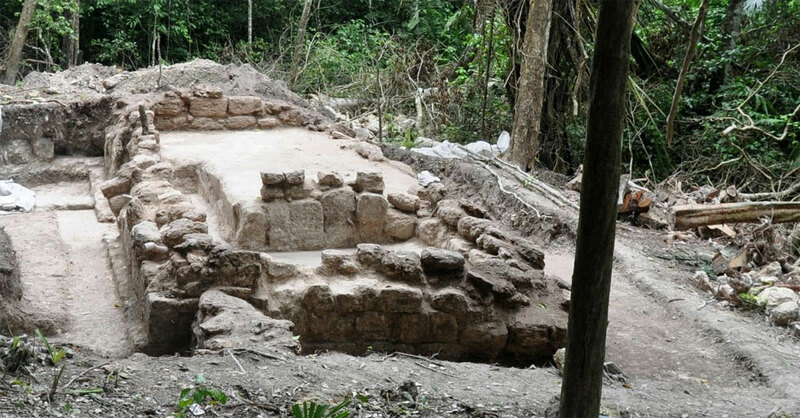 In fact, there are several lines of architectural evidence demonstrating that El Palacio was abandoned for an indeterminate time and then reoccupied and renovated. There is further evidence of reoccupation and remodelling of the architecture and the above photograph shows the possible stairway (the large shaped stones in the lower right corner) and the beginning of the curved wall at the base of Structure 4D2. To the left, roughly coinciding with the origin of the low curved east wall and the possible stairway intersection, the exterior of Structure 4D2 was raised by the deposition of chert cobbles and boulders. It appears that at some point in the building’s history the platform that Structure 4D2 rests upon was raised, creating space for the later addition of Room 1. Below is picture of an annex on the southwest side of 4D2 that probably is associated with the later construction phase. The wall is poorly made and the roof was most likely supported by a series of posts, evidenced by the post holes in the plaster floor. A total of ten burials were found during the excavation of Structure 4D2. The remains are still being analysed but many seem to be secondary interments associated with some sort of ritual “christening” of the building. One jade artefact was found at 4D2 which may be an ear spool. Structure 4C12 is one of at least four houses in the Courtyard B complex (see above photo representing the latest architectural phase). There is a narrow entry way leading into the house from the only doorway that can access the courtyard directly and an offset wall which is the architectural boundary of Courtyard B.